Participants at the third annual Muslim & Jewish Women Leadership Conference. Photo courtesy of Drew University/Karen Mancinelli. 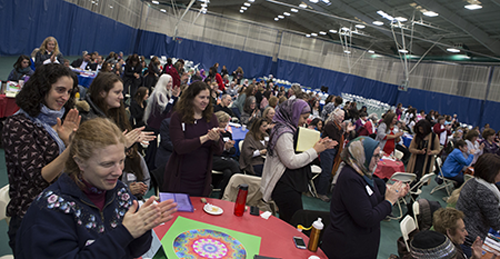 There are those who would not consider a place safe that accommodates only Jews and Muslims, but creating a safe space was all in a day’s work for the 500 participants of this year’s annual Sisterhood of Salaam Shalom Muslim & Jewish Women Leadership Conference (SOSS), held on December 4 at Drew University in Madison, N.J. Started in 2010 by Olitzky and Rutgers University professor Atiya Aftab as a single chapter in Central New Jersey, SOSS has grown to 50 chapters across the country—from Los Angeles to Houston to Washington, D.C.—and is clearly filling a need. Sheryl Olitzky speaks to the crowd. 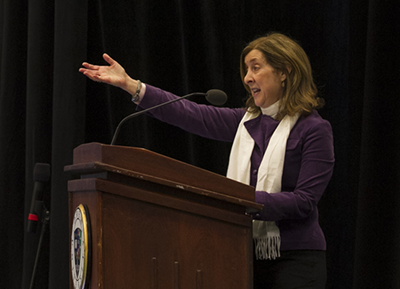 Photo courtesy of Drew University/Karen Mancinelli. The closing event literally brought the day’s agenda full circle when participants marched the perimeter of the university’s gymnasium in silence and then held hands to sing about peace, letting down their guard in the safe space sisterhood had created. Thank you for writing and posting about this amazing event. What an amazing event. As a man deeply committed to peace, I am totally jealous of this gathering of wise women. I either wish that men could be included or that a similar group springs up for the male counterpart! Let’s all go to the web site of Palestinian Media Watch to find out what the so-called “moderate” Palestinian leadership tells its own people vs what it tells the US/West – IN ITS OWN WORDS. Palestinian Authority/PLO/Fatah/Abbas & Co.’s sole narrative, including that directed at children and teens, consists of genocidal anti-Semitism, terror advocacy and adulation of terrorists, denial of Israel’s right to exist by denying all Jewish history in the land, and the oft stated commitment to work until Israel is completely destroyed and replaced by a Palestinian state. Read it. Hear it. View it. IN ITS OWN WORDS. Rationalizing this evil is also evil.